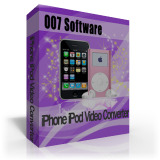 007 iPhone iPod Video Converter is powerful and easy-to-use iPhone iPod converter software which helps you convert all popular video formats to iPhone iPod video MP4 and music MP3, M4A directly. It not only allows you to convert the whole of a video or audio. More differently, it can convert any clip of a file. You just need to set the starting point and ending point to choose the duration. 007 iPhone iPod Video Converter can also transform your favorite pictures and photos into iPhone iPod video . Integrated the unbeatable encoder and decoder brings you awesome video quality in the fastest conversion speed. This unique 007 iPhone iPod Video Converter also makes you freely set output manners that you want. So, without any hesitation, try it and enjoy yourself! DVD Creator - It can create DVD from all video formats such as DivX, Xvid, AVI, MPEG, WMV, QuickTime, Real Video format, etc.